After the outdoor light of La Grande Jatte and the studio light of The Models, here is an artificial light; the gas and acetylene lamps create the mood of traveling fairs. This work shows to what extent Seurat was concerned with construction. It is clear here how deeply Seurat had been impressed by David Sutter's observations on the architectonics of classical works of art. The canvas analyzes itself, as it were. It would be pedantic nowadays to trace the counterpoint of verticals and horizontals, clear-cut rectangles and blurred ovals, the whole broken by a few slanting lines (the branches of the tree, the ringmaster's riding crop, the railing of the staircase behind the trombone player at the center). This is perhaps the sole work of nineteenth-century painting that unequivocally anticipates Cubism (and even Purism). It heralds the coming of a new school, which, from 1908 on, was to revolutionize form no less profoundly than Seurat revolutionized the treatment of color. 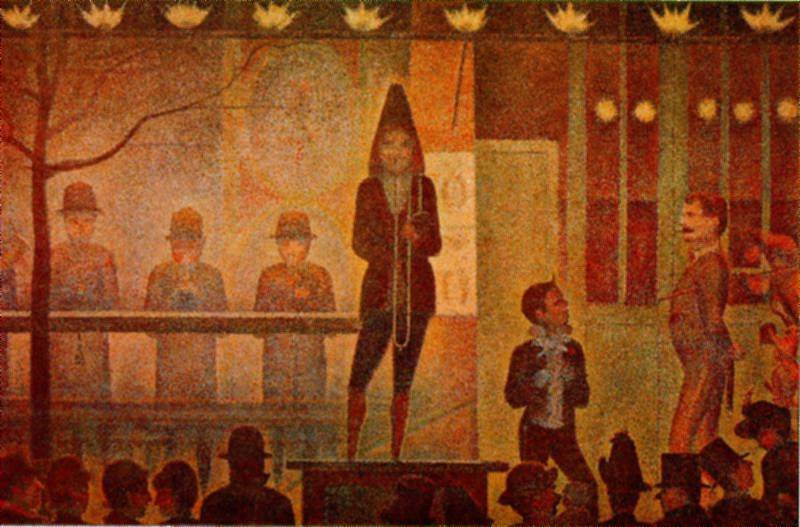 Seurat here is at his coldest and most austere. It would seem that the balance of La Grande Jatte and The Models has given way to excessive deliberateness. We may say that like certain works of Poussin, The Side Show is a painting which has been wholly thought out in advance. The face of the ringmaster (or perhaps animal trainer), with the same haircut and mustache twisted to turn up, will reappear in Le Chahut, where the riding crop is replaced by the conductor's baton.